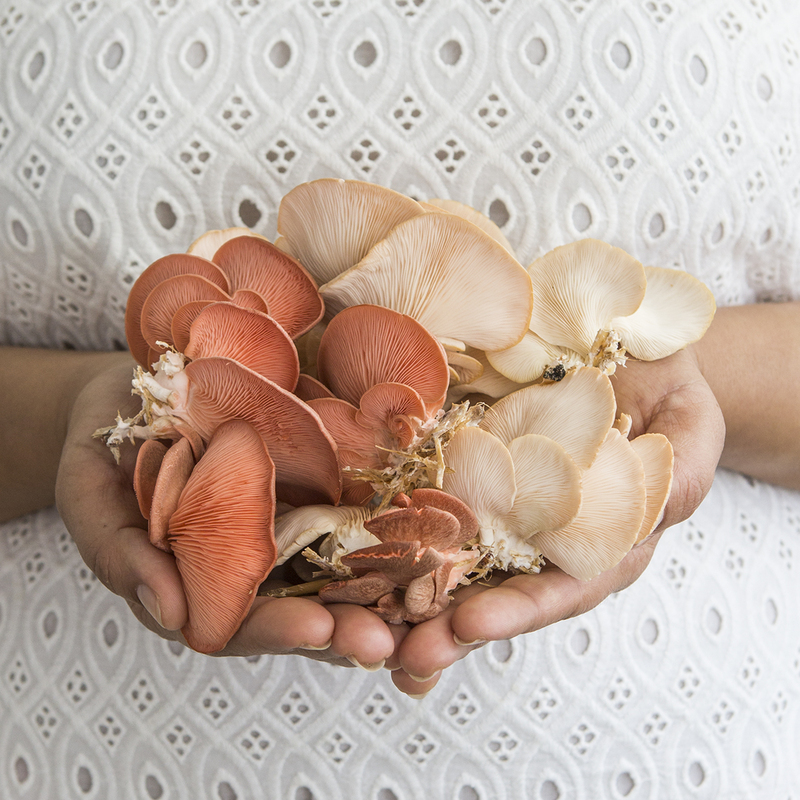 Behind the glass doors of the mushroom cellar, we grow pink and white oyster mushrooms in bags of straw. Our gardeners cut and harvest every 2 to 3 days for Babel restaurant. In the cooler months, we combine them with one of winter’s buried treasures, Jerusalem artichokes. Preheat the oven to 180°C. Wash and dry 400 g Jerusalem artichokes. Place on a baking tray, drizzle with a little olive oil and scatter with fresh thyme. Cook for 10 minutes until soft and remove. Season with salt and pepper and keep warm. Melt 100 g butter in a heavy-bottom frying pan. Add clusters of 200 g white and 200 g pink oyster mushrooms and flash fry on both sides until seared but not completely cooked through. Remove from heat, drizzle with a little lemon juice and season with a little salt. Keep warm. and smear with a little melted butter. Place under the grill and cook for 5 minutes then remove from oven. Add 250 ml heavy cream in a small saucepan and add 100 ml freshly squeezed Cara Cara blood orange juice and 5ml Cara Cara blood orange zest. Heat through slowly but do not boil. Season with salt and a little pepper and keep warm. 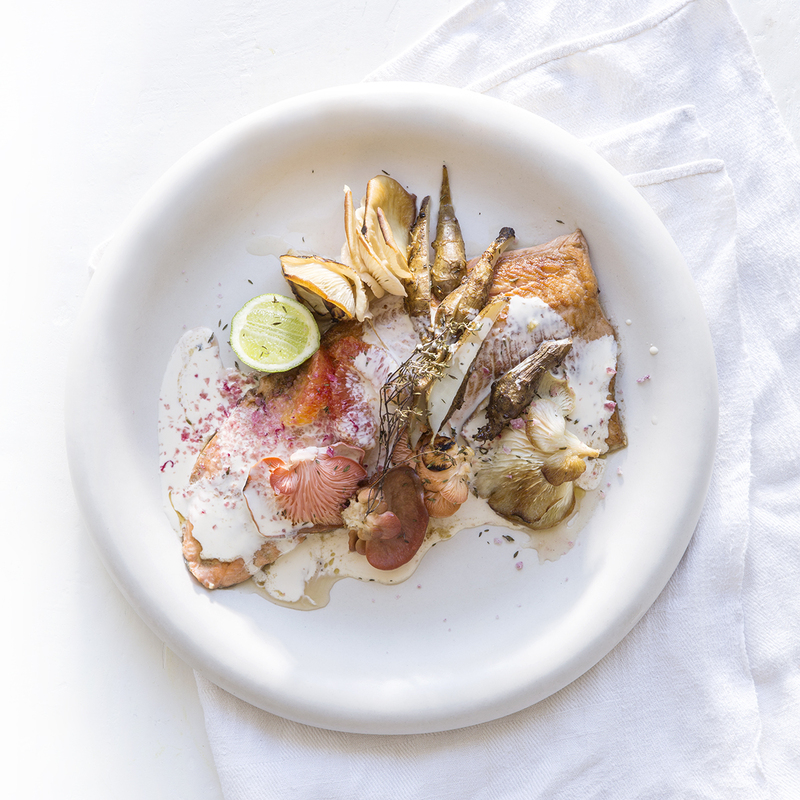 Heat the plates and place a trout side on each plate. Top with mushrooms, Jerusalem artichokes and spoon cream sauce over. Garnish with blood orange segments, a slice of lime and pink salt. Thanks for sharing! The dish looks delicious, and the mushrooms you grow look beautiful. I am excited to try the recipe!